The Buzzer blog » Jot Kailay wins the One in a Billion contest! Jot Kailay wins the One in a Billion contest! The 10 contest finalists together---Carla Shore, Julie Hanson, Alexandra Wood, Jot Kailay, Colleen Gorrie, Frances Galea, Elvira Zampieri, Sandy Keith and Yvonne Pendree. At the back we have Province deputy editor Fabian Dawson; SkyTrain president Doug Kelsey, TransLink CEO Tom Prendergast and Province president and publisher Kevin Bent. Last Friday, we drew a winner from 10 finalists in our One in a Billion contest: Mr. Jot Kailay! 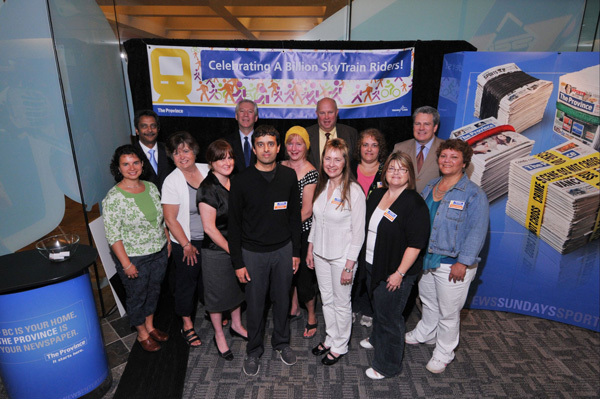 The contest, organized together with the Province newspaper, celebrated SkyTrain’s milestone of one billion passenger trips this year. Jot’s 100-word contest entry talked about a whole train joining in with a little girl’s rendition of “If You’re Happy And You Know It”: all of the 10 finalist entries can be found on the Province’s site. 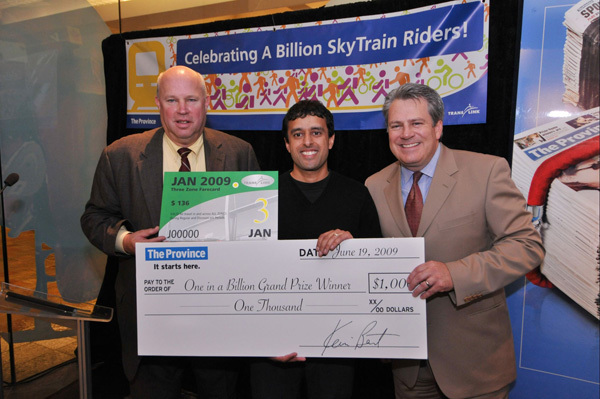 And as the grand winner, Jot took home was $1000 and a year of transit passes. Our nine runners-up won a free monthly pass for up to three zones of travel. Thank you to everyone for entering and congratulations to the winners again! Hey thats me ! :) I read about the contest on this very blog, so thanks. I moved from Edmonton about 4 years to live in a more urban setting. I’m super impressed by how forward thinking Translink is. Thanks. Well congrats again Jot! Glad to hear the Buzzer blog connected you with the contest :D Enjoy the passes and the $1000!